DONG Energy has announced plans to increase their renewable energy efforts in England by extending Liverpool’s successful Burbo Bank offshore wind farm. The site currently generates more than 90MW for the UK, but the Danish company are looking to upscale their efforts by introducing 69 new turbines to increase production to 250MW - enough energy to power 170,000 homes. 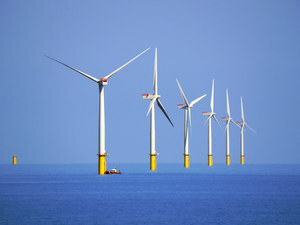 Britain currently leads the way in offshore wind energy production, producing up to 3.7GW yearly. But, targets are set to rise to 41GW over the next 15 years, despite vocal opposition claiming that the turbines ruin natural views and country sides. The project could bring in £250K a year for the local economy and the Danish company have promised to support the Liverpool area by setting up a community benefit fund. To further curry the favour of British residents, Executive Vice President of DONG Energy, Sam Leupold has announced that the project will use a new model of wind turbine to increase manufacturing competition and benefit consumers. Danish company, DONG Energy outlines support for Britain's North West economy following an announcement that the company plan to expand Liverpool's Burbo Bank offshore wind farm. The project is an effort to upscale Britain's wind energy production to reach a yearly production target of 41GW by 2030.